This course will provide a comprehensive study of the many ways to interact with computers and computerized devices. An “interaction technique” starts when the user does something that causes an electronic device to respond, and includes the direct feedback from the device to the user. Examples include physical buttons and switches, on-screen menus and scroll bars operated by a mouse, touch screen widgets and gestures such as flick-to-scroll, text entry on computers or touch screens, consumer electronic controls such as remote controls, game controllers, and adaptations of all of these for people with disabilities. We will start with a history of the invention and development of these techniques, discuss the various options used today, and continue on to the future with the latest research on interaction techniques presented at conferences such as ACM CHI and UIST. Guest lectures from inventors of interaction techniques are planned. Students will have a choice for final projects that can focus on historical or novel interaction techniques. For example, one option will be to create a novel technique, perform a user study of it, and write a paper about the result, which may be suitable for conference submission. (Last time, a group inventing a new way to do text entry on a watch did get a publication!) Another option is to create a Wikipedia page about an inventor or interaction technique. Or you could investigate and write a paper or make a video about the history and various previous designs for widely used interaction techniques, possibly including an interview with the inventor(s). A tentative schedule for the course and topics for class periods is available. There will definitely be changes. See also the Homework list, and homeworks policies. The index for previous year's materials is also available. "Interaction Techniques is my favorite course this semester." "This was a very informational course. I loved learning about all the history of the different interaction techniques and where they come from." "I learned a lot from Professor's experience and insights." "Every lecture was fun!" "It was a great and thorough overview of many different forms of interaction" "I liked how it was a very comprehensive study or description of a wide variety of interaction techniques. I've just been using all of these before without knowing the thought process made behind them." "[I liked best the] freedom of projects. Interesting and engaging homeworks." "Nice range of topics, use of readings/studies as well as our own explorations" "It is a very cool course that covers the topic very well." 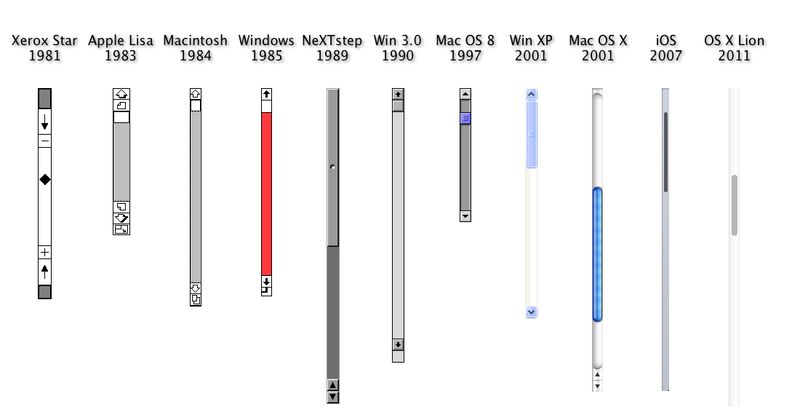 Previous years' projects created new pages for David Canfield Smith and Norm Cox, the entire Pull-to-Refresh page, and the history section for scrollbars: http://en.wikipedia.org/wiki/Scrollbar, and some others. I promised Shumin Zhai that someone would make a page for him, so I'm hoping a group will be excited about this project! Especially the scrolling test is problematic, but the Fitts Law test can be better too. Can we come up with tests that work on watches? Help with Prof. Myers's book about Interaction Techniques. Most of them are still alive, and Professor Myers is personally acquainted with many of them. Elliot Lockerman, Shuobi Wu, Ariel Rao, Jarret Lin, Neil Bantoc, and Brad Myers. "Smartwatch Text Entry Using Five to Seven Physical Keys," 2017 IEEE Symposium on Visual Languages and Human-Centric Computing (VL/HCC'17), October 11 –14, 2017, Raleigh, NC, pp. 291-295. local pdf.